ظهر العملة بريتانيا وافقة مع الدرع ، والرمح الثلاثي وغصن الزيتون وعبارة " بريتانيا 2019 1 أوقية 999.9 ذهب صافي"
بريتانيا وافقة مع الدرع ، والرمح الثلاثي وغصن الزيتون وعبارة " بريتانيا 2019 1 أوقية 999.9 ذهب صافي"
1 أوقية 2019 عملة ذهبية لبريتانيا We’ll assure you the lowest price online when you purchase your 1 oz 2019 Britannia gold coin from our internet shop. This dazzling creation is the latest in a line of bespoke Britannia’s released by the British Royal Mint since 1987. The reverse feature is a majestic rendering of Lady Britannia, Britain incarnate with her Corinthian helmet, olive branch, trident and Union Jack shield. She is set against a micro-engraved, starburst textured field, encompassed by a frame bearing details of title, year of issue, metal weight, content and purity. The coin’s obverse is home to Jody Clark’s meticulous rendering of Elizabeth II in profile, adorned by her rich State diadem. The obverse of this dazzler also boasts beautiful, light refracting, micro-engraved dot texturing, along with a delicate, notched frame, Elizabeth II’S regal title and the coin’s high denominational value. The spirit of Britannia stretches back for more than two millennia, when the British Isles were founded under the territorial title of Britannia. 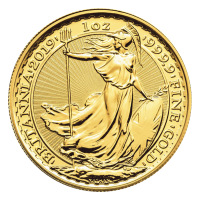 Embrace the glorious symbolism of the penultimate British icon and diversify your holdings with a 1 oz 2019 Britannia gold coin today.